With so many of Icelands tourist attractions right off its Ring Road some visitors never leave the convenience of Icelands most major roadway. Icelands interior, however, is arguably the most beautiful part of Iceland. Getting off the Ring Road isnt always easy: bridge dont exist, rivers must be forded, food and water brought in, and hiking involved. 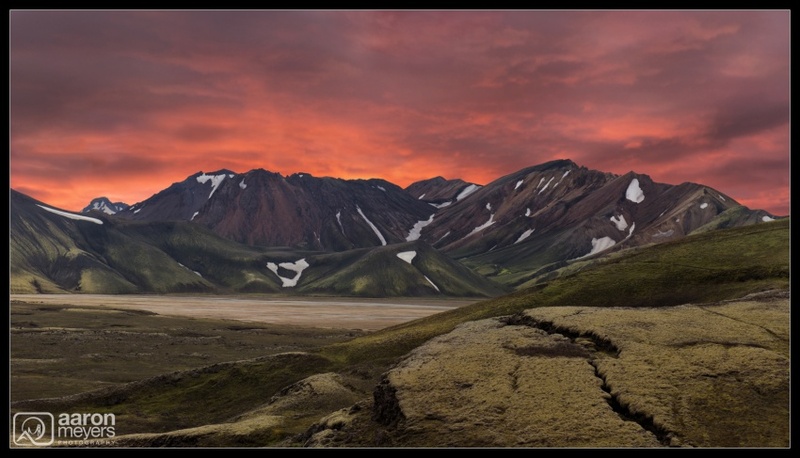 Landmannalaugar (pronounced Land-manna-lo-ger) is one of those places that is worth all the effort it takes to get here. Multicolored rhyolite mountains, expansive lava fields, and snow make for a beautiful spectrum of pink, red, brown, green, yellow, black, and white. Snow fills in many of the gaps in the wavy hills. Sammi and I arrived around 1pm and spent the afternoon exploring some of the more popular hikes. When the sun would peek out from behind the clouds it would light up the hills with beautiful color and brought out the contrast with the snow pockets. We left Landmannalaugar in the evening, drove to the Golden Circle and ate delicious reindeer burgers. Having kept a super busy schedule for the past 2 weeks, we found ourselves shocked that it was 8:30pm and we had absolutely no plans. A layer of fog was creeping its way into the Golden Circle but back by Landmannalaugar looked clear. Sammi looked at me and said youre going to regret not going back if you dont go Back in the car and to Landmannalaugar we went. Boy am I glad we went back – another killer sunset I debated long and hard about this composition: the hill in the foreground blocks some of the mountains but also provides a nice line into the photo thanks to the crack. When I moved around the hill to avoid blocking the mountains, the photo felt empty so back to the cracked hill I went.